Symbology is the use of symbols to represent the features and attributes of a map layer. For example, in a layer of cities, black circles might symbolize the cities. The size of the circles might be varied to symbolize each city's population. Symbols are defined by visual properties such as shape, size, color, spacing, and (in 3D) perspective height. 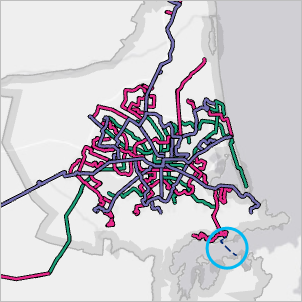 In this project, you'll make a map of bus stops, bus routes, and population density in Christchurch, New Zealand. At the top of the dialog box, in the Search box, type Symbolize map layers tutorial and press Enter. In the list of search results, click Symbolize map layers to select the project package. 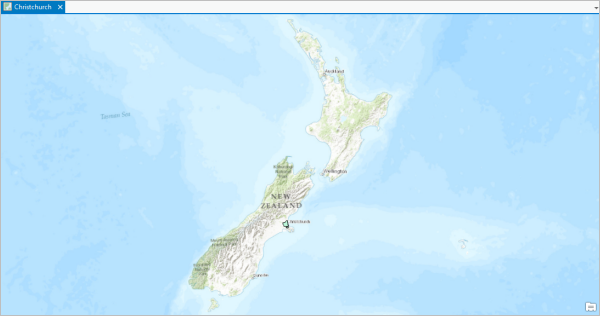 The project opens with a map view of New Zealand. You'll zoom in to the study area of Christchurch. With a population of 381,800, Christchurch is the third-largest city in New Zealand. On the ribbon, click the Map tab if necessary. In the Navigate group, click Bookmarks and click Christchurch Urban Area. The map zooms in to the urban area. The Urban Area layer is symbolized with a light-green fill color and a black outline. The purpose of the Urban Area layer is to define the study area boundary. The solid fill, however, obscures the basemap. You'll change the symbol to make the interior area hollow. You'll also give the boundary a softer, shaded appearance. On the ribbon, click the View tab. In the Windows group, click Reset Panes and click Reset Panes for Mapping. This ensures that the Contents and Catalog panes are open and that other panes are closed. In the Contents pane, click the Urban Area layer to select it. On the ribbon, the Feature Layer contextual tab group appears. On the ribbon, under Feature Layer, click the Appearance tab. In the Drawing group, click Symbology . The Symbology button is a split button. Click the top half of the button (the icon) unless you're instructed to click the bottom half (the drop-down menu). In the Symbology pane, next to Symbol, click the symbol patch. The pane changes to show symbol formatting options. At the top of the pane, click the Gallery tab if necessary. 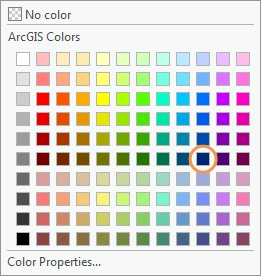 In the ArcGIS 2D style, several symbols are available with different colors and outlines. You can hover over the symbols to get more information. Click the Extent Transparent Gray symbol to select it. The symbology for the Urban Area layer updates on the map and in the Contents pane. You can see through the symbol to the basemap underneath. This is a good start, but your goal is to create the effect of a shaded boundary with a transparent interior. Left: The urban area is symbolized with a partly transparent gray fill. Right: The desired effect is a shaded boundary with a fully transparent interior. At the top of the pane, click the Properties tab. The Properties tab has three graphical tabs under it. On the Symbol tab , you can change properties of the symbol. For example, you can change the fill color, outline color, and outline width of a polygon symbol. Click the Layers tab . 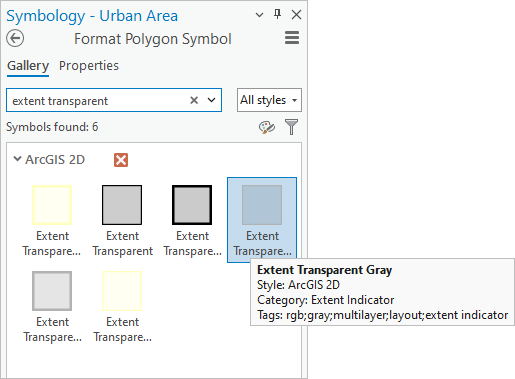 On this tab, you can change properties of the graphical elements, or symbol layers, that comprise the symbol. This gives you more control over the symbol's appearance. This symbol is composed of two symbol layers: a stroke and a fill. Click the Structure tab . On this tab, you can change the symbol's structure by adding and removing symbol layers. You can also apply effects. 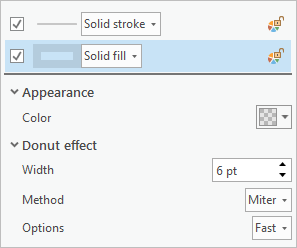 In this case, you'll add a donut effect to the fill layer. The donut effect restricts the gray fill to a ring at the edge of the polygon. The interior is transparent, like a donut hole. On the Structure tab, under Layers, under the fill symbol layer, click Add effect. On the drop-down menu, click Donut. The effect is previewed in the window at the bottom of the pane. Now that you have applied the effect, you'll specify its width on the Layers tab. Click the Solid fill symbol layer to work with its properties. Expand the Donut effect heading and change the Width to 6 pt. The symbol preview is updated at the bottom of the pane. The new symbology is applied to the map. In the Contents pane, turn on the Bus Stops and Bus Routes layers. You'll change the symbology for both layers in the next sections. First, you'll choose a more neutral basemap. On the ribbon, click the Map tab. In the Layer group, click Basemap and click Light Gray Canvas. The light gray canvas basemap includes two layers: the World Light Gray Canvas Base layer at the bottom of the Contents pane and the World Light Gray Reference layer at the top. For this map, you don't need the reference layer. In the Contents pane, right-click the World Light Gray Reference layer and click Remove . Before continuing, you'll save your changes. The current symbol for the Bus Stops layer is a small dark circle. You'll replace it with a symbol that represents bus stops more specifically. In the Contents pane, click the Bus Stops layer to select it. The pane changes to present formatting options for point symbols. 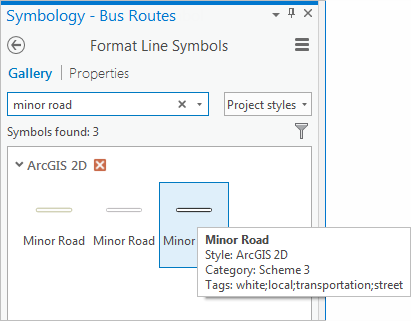 If you previously closed the Symbology pane, you can open the pane directly to its symbol formatting options by clicking the symbol patch for the Bus Stops layer in the Contents pane. At the top of the pane, click the Gallery tab. In the search box, type bus and press Enter. In the ArcGIS 2D style, symbols for bus stations are found. These symbols are suitable for bus stops too. Click the smallest bus station symbol to select it. The map and Contents pane update with the new symbol. You'll change the symbol properties. In the Symbology pane, click the Properties tab and click the Symbol tab under it. Under Appearance, click the Color drop-down arrow. On the color palette, choose Cabernet (last row, last column). When you hover over a color square, its name appears. 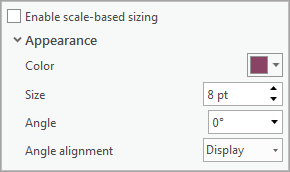 Change the size to 8 pt and press Enter. Click Apply. At the bottom of the Symbology pane, under the symbol preview, change the magnification setting to Zoom to fit. The symbol preview shows that the Cabernet color is applied to the bus icon but not to the outline. The Bus Station symbol is composed of two marker symbol layers: the bus icon and a white circle with a gray outline. Click the white circle symbol layer to select it. Under Appearance, click the Outline color drop-down arrow and choose Cabernet. In the preview window, the icon and the outline are now the same color. The bus stop symbol is updated on the map and in the Contents pane. At the current map scale, the symbols clutter the map. You'll set a visibility range for the layer so the symbols display only when the map zooms in. In the Contents pane, select the Bus Stops layer if necessary. The symbols disappear from the map. In the Contents pane, the layer's check mark is gray. This means that the layer is turned on but not visible at the current map scale. In the lower left corner of the map view, click in the map scale box. Replace the current value with 1:23,999 (or simply 23999). Press Enter. The map zooms in and the bus stops display. On the ribbon, click the Map tab. In the Navigate group, click the Previous Extent button to return to the full urban area. The bus routes are currently drawn with a single symbol. The attribute table for the layer contains attributes such as route names, route directions, and route types that can be used to symbolize the features in more meaningful ways. In the Contents pane, click the Bus Routes layer to select it. Right-click the selected layer and click Attribute Table . The attribute table opens. You'll symbolize the routes according to their values in the Type field. Scroll down through the table and look at the values in the Type field. City connectors connect suburbs to the city. Suburban links connect suburbs to each other. Metro lines follow major roads. Ferries connect the suburb of Lyttelton to Diamond Harbour. You'll represent each route type with a different color. Close the Bus Routes attribute table. In the Symbology pane, click the Primary symbology drop-down menu and click Unique Values. Click the Field 1 drop-down menu and click Type. 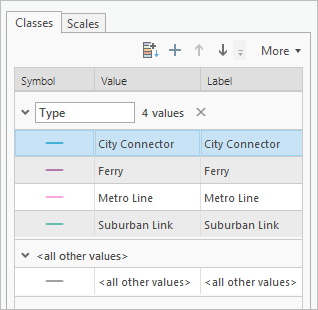 In the lower half of the pane, on the Classes tab, symbols are assigned to the unique values in the Type field. The map and the Contents pane are updated. There is also a gray symbol representing all other values. You don't need this symbol for this layer. Above the list of values, click the More drop-down arrow and uncheck Show all other values. The <all other values> symbol is removed. The <all other values> symbol is used for features that you want to display but don't need to differentiate. For example, suppose that Metro Line routes are the focus of your map and the other routes are background information. You can remove the other route types from the list of values by right-clicking them and clicking Remove . The features for the removed routes still draw on the map but are symbolized with the <all other values> symbol. See Unique values for more information. Click the More drop-down arrow again and click Format all symbols. At the top of the pane, click the Gallery tab. In the search box, type minor road and press Enter. In the ArcGIS 2D style, click the Minor Road symbol with the black outline. You'll apply a color scheme to the new symbol. At the top of the Symbology pane, click the Back button . On the Primary Symbology tab , click the Color scheme drop-down arrow. At the bottom of the list of color schemes, check the Show names box. You can also hover over a color scheme to see its name. Click the Dark 2 (4 classes) scheme. You'll change the Ferry symbol because ferry routes are conventionally symbolized with dashed lines. In the lower half of the pane, click the line symbol for Ferry to show the symbol gallery. In the search box, type ferry and press Enter. 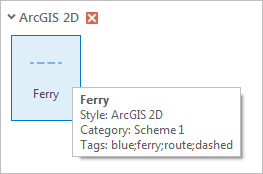 In the ArcGIS 2D style, click the Ferry symbol. You can browse to symbols in the gallery as well as search for them. On this map, the ferry symbol would look better if it were darker. At the top of the pane, click the Properties tab. On the Symbol tab , under Appearance, click the Color drop-down arrow and click Dark Navy. Click Apply. The symbol updates in the Contents pane and on the map. The bus route symbology looks good but can still be improved. You'll use symbol layer drawing for more control over the symbology at road crossings and overlaps. Left: Suburban Link routes cross each other. You'll remove the road casings (the black outlines) at the intersections. Right: A blue Metro Line and a red Suburban Link share the same route, and a Suburban Link crosses a City Connector. You'll specify which features in the layer draw on top of which others. 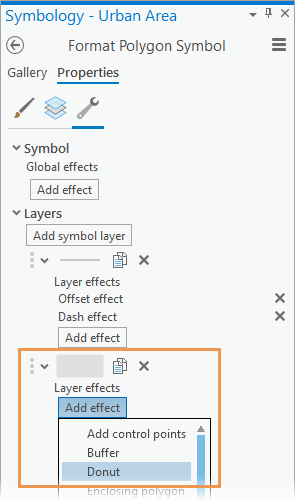 At the top of the pane, click the Symbol layer drawing tab . Click Enable symbol layer drawing. On the Basic tab, drag Metro Line to the top of the Drawing Order list. Drag Ferry to the bottom of the list. The map updates as you change the drawing order. Metro Line features now draw on top of other bus routes: a metro line is never visually interrupted by another route. Likewise, City Connector features draw on top of Suburban Link features. Symbol drawing order is independent of the order of symbol classes in the Contents pane. In the Contents pane, the symbol classes, representing the four unique route types, are still in their default alphabetical order. You can change this order by dragging symbol classes up and down on the Primary symbology tab . In the Symbology pane, notice that three of the routes are set to Join. This setting removes road casings where features of the same route type intersect. You'll change the setting to Join and Merge to remove road casings at intersections between different route types. Click the drop-down arrow next to City Connector and click Join and Merge. Click the drop-down arrow next to Suburban Link and click Join and Merge. The map updates to reflect the settings. The Join and Merge setting affects the drawing behavior of a symbol in relation to the symbol above it. 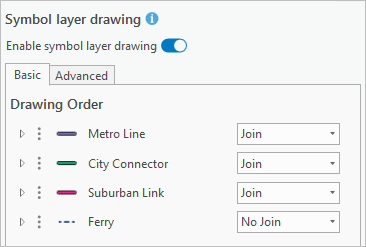 There is no Join and Merge setting for the Metro Line symbol because it is at the top of the drawing order. Both the Join and Join and Merge settings affect the drawing relationship of a symbol's component symbol layers (in this case, the two stroke layers, representing roads and casings, that comprise the bus route symbols). The only available setting for the Ferry symbol is No Join because this symbol is composed of a single stroke layer. For more information, see Symbol layer drawing. Zoom the map to a larger scale, such as 1:50,000, to see the effect better. Pan to different parts of the urban area. When you're finished, zoom to the Christchurch Urban Area bookmark. 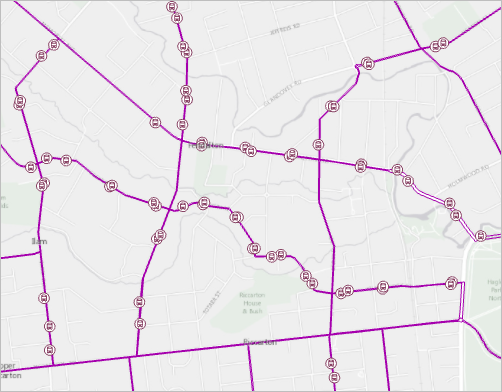 Finally, you'll symbolize the population in the Christchurch urban area to visualize the relationship between bus routes and population. In the Contents pane, turn on the Population layer. A dense layer of points covers the urban area. Each point is the center of a meshblock. A meshblock, like a United States census block, is a small area for which census data is collected. In this layer, each point stores the population of its meshblock. On the map, click a population point. 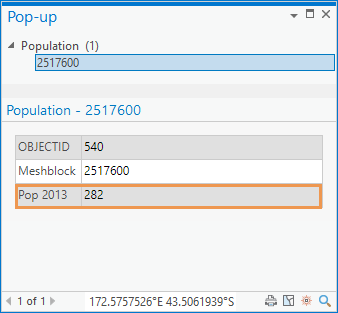 The Pop-up pane shows the 2013 population for the meshblock associated with the point. By drawing the layer as a heat map, you can see where population is concentrated. In the Contents pane, click the Population layer to select it if necessary. In the Symbology pane, click the Primary symbology tab . Click the Primary symbology drop-down menu and click Heat Map. The heat map displays. At the moment, it represents the density of the points, not their population values. In the Symbology pane, click the Weight field drop-down menu and click Pop 2013. To display the new symbology properly, you'll set the heat map to update dynamically when you make changes. Click the Method drop-down arrow and click Dynamic. The heat map represents the population density. Yellow areas are high density, red and purple are in the middle, and blue areas are low density. You can show more variation in the map by adjusting the Radius setting. Change the Radius setting to 15 and press Enter. The pattern shows more local variation. The larger the radius value, the more generalized the pattern. You can experiment with different settings—no value is right or wrong. The heat map covers the bus routes, so you'll change the order of layers in the Contents pane. In the Contents pane, drag the Population layer under the Bus Routes layer. Make sure that the Population layer is still selected in the Contents pane. On the ribbon, under Feature Layer, click the Appearance tab. In the Effects group, move the Layer Transparency slider to 65%. In the Visibility Range group, click the drop-down arrow next to In Beyond and click 1:50,000 to set the maximum display scale for the heat map. At larger scales, the pattern is too local and the heat map looks bubbly. Zoom and pan to explore the map. The bus routes correspond well to the populated parts of the urban area. In this tutorial, you used different primary symbology methods—Single Symbol, Unique Values, and Heat Map—to draw the layers in your map. You also worked with symbol layers and structure to enhance the primary symbology in many ways. There are more primary symbology methods to explore and many more ways to customize symbols for your maps. To be inspired by examples of maps designed with ArcGIS Pro and other ArcGIS applications, visit the Maps We Love site. Next, try the Label your map or Make a layout tutorials.